“I wish I could be an Instagram Influencer,” is something I’ve been hearing a lot lately. Being an influencer seems to be all the rage these days. I mean, why wouldn’t you want free hotel stays and free samples sent to you all the time? Sounds pretty ideal if you ask me. However, some influencers seem to be taking things a little too far for that perfect shot. Just recently, things got a little dangerous for one, leaving me wondering just how glamorous the #influencer lifestyle really is. Influencers always have to be on the lookout for photo ops that will get their content to the top of users’ feeds and result in the maximum number of likes. Katarina Zarutskie, a 19-year-old Instagram model, was about to do just that when things took a wrong turn. 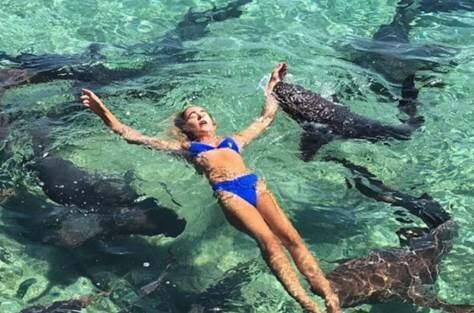 In the attempt to get the Instagram shot of a lifetime, Katarina decided to jump into shark infested waters (no, I am not kidding). And yes, this story ends exactly how you might imagine… in disaster. One of the sharks attacked Katarina, biting her arm and pulling her underwater—which leads me to my ultimate question, how far is TOO far for an Instagram? As someone with an irrational fear of sharks, I would most definitely classify this as too far. Thankfully she was able to walk away from this incident with just a bite on her arm and all her limbs intact. However, this should serve as a reminder that the “do it for the Insta” mindset we seem to aimlessly live by does not apply to every situation. C’mon, people! You should probably think long and hard about if that photo is worth something as dangerous as, oh I don’t know… let’s say, a shark attack!